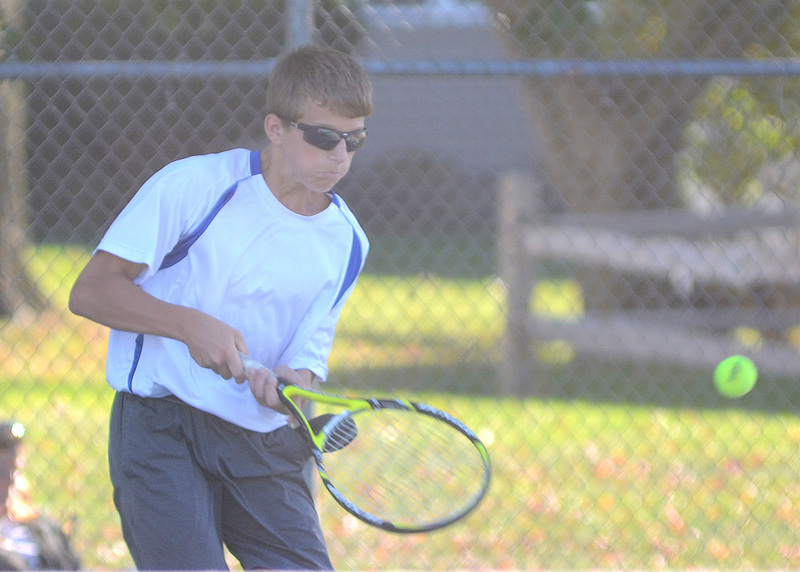 Triton’s boys tennis team earned its first Hoosier North Athletic Conference win of the season with a 4-1 victory over North Judson-San Pierre at home Tuesday. Two of the matches went three sets, with the decisions going both ways. John Gardner earned Triton the win at 1 singles, bouncing back from a 6-1 first-set loss with 63 and 6-4 victories, while Trevor Miller snapped back from a 6-4 loss to Gavin Alonso in the first set at 2 singles, 7-5, but lost the third set 6-2. Connor Large beat Caleab Shiremen, 6-3, 6-2 at 3 singles, Carter Kuntz and Chase Butler blanked Blake Shell and Gavin Legac 6-0,6-0 at 1 doubles, and Tyler Heckaman and Grant Eib put away Kyle Burkett and Zach Hughes 6-1,7-6(6) at 2 doubs. Triton moved to 2-2 overall and 1-1 in the HNAC with the win. The Trojans will look to avenge an earlier HNAC loss to Knox at home Wednesday at 5:30 p.m.
Wawasee earned wins on all but the 1 singles court at home Tuesday. Grahan Perek beat Jack Gibbons 6-2, 6-0 at 2 singles, and Colin Rhoades was a 6-1, 6-4 winner over Dylan Eggl at 3 singles. Jacob Krugman and Grant Brooks combined for a 6-1, 6-0 win over Josh Elliot and Austin Smith at 1 doubles, and Clayton Firestone and Zeke Keim claimed a 6-1, 6-3 decision over Austin Frey and Nate Robinson at 2 doubles. The Warriors’ only loss came at 1 singles, where Zach Leedy fell 6-1, 6-3 to Myles Smith. The JV match resulted in a 1-1 tie. Taylor Fiedeke won 8-0 at the JV 1 singles court for Wawasee. The Warriors host West Noble Thursday. Valley won just two total games in a loss to Wabash Wednesday. Ethan Yates fell 6-0, 6-2 at 3 singles, but that was as close as the Vikings got Payton Mills and Connor Frentzel both fell in straight 6-0 sets at 1 and 2 singles, respectively, and Valley forfeited both doubles matches.